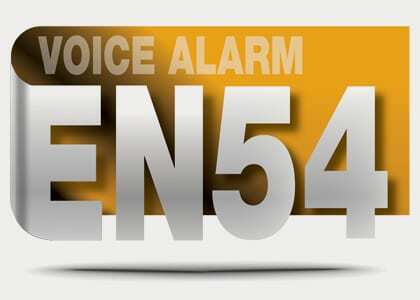 BS EN54 is the latest European standard affecting voice alarm systems and products. (Our certificates are available for download at the bottom of this page). This standard has been adopted by many European countries and, as such, all supplied voice alarm systems should now comply. Fire detection and fire alarm systems. Voice alarm control and indicating equipment. Fire detection and fire alarm systems. Components of voice alarm systems. Loudspeakers. In order to gain BS EN 54 certification products have to be tested by an accredited test house – manufacturers cannot simply claim that their products comply. All manufacturers of voice alarm systems need third party certification to this standard. According to CEN/CENLEC internal regulations, all European countries are bound to implement this standard. Specifiers, consultants, installers and end users need to ensure that the voice alarm equipment supplied has full BS EN 54 third party certification. The overall requirements of a voice alarm system, especially audibility and intelligibility, are not covered in parts 16. Such system requirements may be specified in part 24, in national legislation or contractual documents. Power supply equipment (external to the VACIE*) should comply with the requirements of BS EN 54-4 and requires separate third party certification. However, where power supply equipment is an integral part of a voice alarm system, this is tested along with BS EN 54-16. Manufacturers need to have relevant factory production control procedures in place i.e. ISO9001:2008 (quality management system). The standard does not specify requirements for components as separate parts, they are tested as a whole system. The Vigil2 system has been tested and certified by LPCB and CNBOP, Poland. Our BS EN54 certificates are available for download (simply click on the links at the bottom of this page). Any major product change or new product developed will need further BS EN 54 testing. Manufacturers will be continually audited. VACIE manufacturers will be entitled to show the BS EN 54-16 CE mark. Baldwin Boxall’s VIGIL2 voice alarm products have passed the rigorous third party testing to BS EN 54. Download Baldwin Boxall’s CNBOP BS EN54 certificate. Download Baldwin Boxall’s LPCB BS EN54 certificate. * VACIE = voice alarm control & indicating equipment (component of a voice alarm system that generates and transmits voice alarm signals to loudspeaker circuits when it receives alarm signals from a fire detection and alarm system and/or manual controls).